Brixen, Italy – Durst, an inkjet pioneer and manufacturer of advanced digital production technologies, has helped Gabel Group to transform its retail business and open up more export trade in a partnership approach. 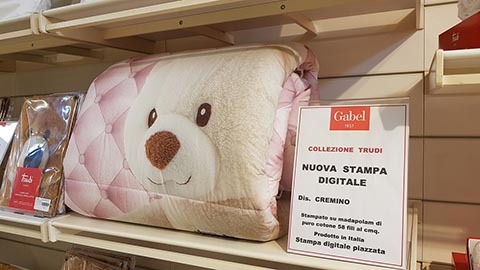 A major household linen producer and retailer based in the heart of Italy’s textile area, Gabel has invested in Durst’s Alpha 330 super high-performance multi-pass printer with the One-Step Greentex P ink. “The face of retail is changing,” said Michele Moltrasio, Chairman and President of Gabel Group. “Today many of the orders involve printing hundreds of metres instead of thousands of metres as in the past, but numbers of orders are going up hugely. Retail shops want different designs and colours every two to three weeks because they want to continue developing new ideas and new collections. As we continue to expand our export market, which we anticipate will double within a year to around 20% of our business, digital will become even more important because virtually every European country has different specifications for its linen requirements. The Durst Alpha 330 is a perfect fit for us. The Alpha 330 uses the Durst One-Step Greentex P ink, which was developed especially for the Alpha Series of printers. The environmentally friendly pigment inks are based on Durst Water Technology. Materials such as cottons, polyesters and polycottons do not require pre- and post-treatment with this ink, so the whole process is accelerated and simplified, and is nearly a “dry” process.